Hack, hack, slash. Slash, slash, bash. Yu-kai checked the clock. It was 2am. He had been grinding and killing monsters for the past four hours so that he could get the last piece of the Paladin set equipment: Griswold’s Legacy. After this final piece was obtained, Yu-kai’s Paladin would officially become OP (Overpowered) and his friends would surely envy his achievement. “They’re going to beg me to be a part of every single one of their games once I get this.” Yu-kai thought. Hack, hack, slash. It was now 3am. His homework lay on his desk, begging to be finished. But Yu-kai was strong. He was motivated and he was determined. He wouldn’t sleep or touch his homework until he found that set item. A few weeks later, Yu-kai walked to his friend’s house beaming with pride: he had finally completed his Griswold’s Legacy set. With the extra set item bonuses, he was going to be unstoppable…at least for a little while until the next set of equipment was introduced. He didn’t care that it took him hundreds of hours of dedicated gameplay to achieve this feat. Those late nights grinding and sacrificing were worth it to become the best — to accomplish great things, there must be great sacrifice. When Yu-kai got there, his friends were already in the living room playing video games. None of his friends paid attention. They were all in a trance staring at their screens. Yu-kai was speechless. Over a thousand hours of grinding, killing monsters, and leveling up wasted. His friends felt okay dedicating their lives to a new game every one to two years, but not Yu-kai: he felt defeated, discouraged, and demoralized. In the video game industry, games such as Diablo 2 are categorized as Role Playing Games (RPGs). In these types of games, you take on the role of a protagonist (the Hero) on an epic quest (usually to save the world). After Yu-kai’s Diablo 2 debacle, he realized that the game he was searching for, the game worth dedicating thousands of hours into, was life itself. Instead of slaying demons, Yu-kai started his own business. Instead of searching for treasure chests, he networked with top talents and investors. Instead of gaining and assigning ability points, Yu-kai read books and found mentors to enhance his professional skills. Become a millionaire (Yu-kai wants to clarify that his parents paid for his college tuition, in which he is eternally grateful. He is not entirely “self-made.”). Win the #1 Gamification Guru in the World Award for three straight years. Publish a book about Gamification that has become the de facto material in classrooms around the world. Build the largest Gamification community in the world. Travel to over 40 countries delivering keynote speeches and workshops, charging tens of thousands of dollars for each presentation. Build a multi-million dollar consulting business that has helped organizations such as Google, LEGO, Tesla, Boston Consulting Group, and the governments of the United Kingdom and Singapore. Launch Octalysis Prime, the first ever gamified platform to learn gamification and behavioral design. By all intended purposes, the nerdy kid that was obsessed with video games from a young age has turned his hobby and passion into a wonderful life-game that is just getting started. If you’re a gamer, then we have great news for you: you can immediately apply 10,000 Hours of Play to your own life to start living a healthier, productive, more fulfilling life. If you’re not a gamer, don’t fret. 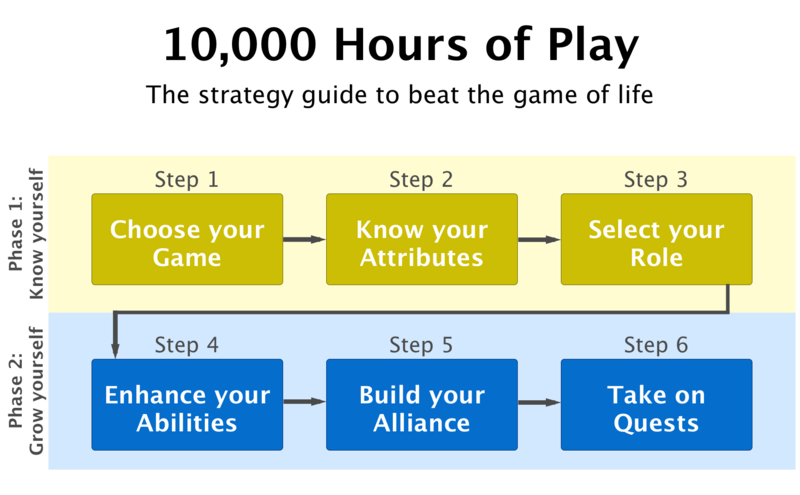 10,000 Hours of Play is a strategy guide that will teach you the mindset and techniques to take control of your life and build something meaningful. And just like the rest of us, you’re a gamer too. You just haven’t realized it yet. So welcome, dear gamer! You are about to embark on an epic journey as the hero of your own game. Get ready for the life transforming adventure that awaits you! Are you an NPC or a Hero? “Hey Tiffany, it’s been such a long time? How are you?” asked Billy. “Oh, you know… same old, same old…” Billy responded. Awkward pause. Tiffany decides to quickly change the subject. I’m sure you’ve been in this position before: you get in touch with an acquaintance and ask, “How’s it going”, only to get a “same old, same old” response. You’ve just met a person that lives the life of an NPC. Every Role Playing Game is riddled with non-playable characters (NPCs). NPCs are programmed, predictable, and stagnant characters in an RPG that consistently serve a specific function: sell the Hero items (such as weapons or potions), provide hints (when the plot demands it), exchange gossipy conversations, or just take up space in the game world so that it looks busy and vibrant for the Hero. A lot of people in our society live like NPCs. They passively do the same activities every single day, complain about their school, work, and other people, spend hours a day watching TV (and yes, even playing games! ), and have no bigger vision for their lives. A person who is stagnant, that hasn’t done anything new in a year or two, that doesn’t have a clear vision about who they want to be and what they want to accomplish, is living their life like an NPC. In contrast to the NPC, the Hero of an RPG is never stagnant. The Hero must travel to new places, slay more monsters, obtain new abilities, form new alliances, conquer new quests, and perhaps even save the world. As the protagonist of the game, the Hero is on a journey of discovery to accomplish an epic mission. In real life, a Hero learns new skills, meets new people, gets into positions of opportunity, achieves new accomplishments, strategically invests their money and resources, and continuously grows as an individual and a professional towards a greater goal — the objective of their game. We believe life is so much better when you live as a Hero as opposed to an NPC. Sure, life as an NPC is safe and secure: you stay in one place, you serve one function, and you’re never in any danger. And sure, life as a Hero can be scary: it’s risky, it’s new, you fail, you need to work harder than NPCs, and you must learn new skills. If you truly enjoy the life of an NPC and would like to stay the same for the rest of your life, that’s completely fine. We are not here to judge peoples’ lifestyles, but unfortunately this series is not for you and you can stop reading here and continue with your life. But if you’re excited about being the Hero of your own game and leveling up in real life, then continue reading. It’s time to start your first hour of play. 10K HP is based on over 20 years of research and has been experienced by hundreds of passionate Overpowered (OP) Heroes that choose to live their lives like an epic game. In each of these quests, OP Heroes gain experience, learn valuable skills, and meet new teammates and mentors. All the quests you do in your life should come together and form your OP Heroes Journey. If you know what you want yourOP Heroes Journey to be, then you can strategically plan out the Quests in your life that will give you the right skills, resources, and support. 10K HP is a 6-step strategy guide (divided into two parts) to turn your life into a game worth playing. Step 1: Choose your Game (Mission) — some people love Star Craft; others enjoy Street Fighter. Some people want to fight global warming; others want to be the best parent they can be. What game will make your life meaningful? Step 2: Know your Attributes (Talents) — characters in video games usually have natural attributes: strength, speed, flying, jumping, etc. In real life, your abilities include physical attributes, personality traits, IQ, EQ, etc. Step 3: Select your Role (Profession) — in video games, a player can choose to be a warrior, wizard, archer, or a myriad of other characters. In real life, you can define your Role in your Game through your profession or “side hustle”. Step 4: Enhance your Abilities (Skills) — in video games, you can earn experience and spend it to learn new spells and make existing Talents stronger. In real life, you take classes, read books, take internships, and develop your personal and professional skills. Step 5: Build your Alliance (Network) — in video games, players that are at level 90 can help a level 10 character gain experience quickly. In real life, your friends can compliment your skills and mentors can help you gain vast knowledge quickly. Step 6: Take on Quests (Achievements) — in video games, Quests help you progress through the game: recover the lost sword, raise a champion Chocobo, unlock a new skill. In real life, quests help you progress in life: start a company, get your PHD, get a mentor, buy a home, or start a family. In Outliers, Gladwell brings up an impressive list of examples, citing Bill Gates, The Beetles, and chess legend Bobby Fischer all requiring around ten thousand hours of experience before becoming world-class. Even known boy-prodigies like Mozart did not write any of his great pieces until he was twenty-one — ten years after he started composing concertos. There are about 262 weekdays in a year. If you practiced for four hours per weekday, then it would take you almost 10 years to master a skill! 10 years is an incredibly long time to invest into the wrong skill or to spend working painfully hard. I have yet to beat Mega Man X (the last boss, Sigma, really is that hard). My brother and I had to use Game Genie to beat Contra III. Yu-kai Chou has never beaten the original Super Mario Bros. on the Nintendo NES. I’m sure there are tons of video games that you played as a kid, but that you didn’t beat; and yet, you still have fond memories of playing that game. It could be the people you played with, the friends you made while trying to figure out how to beat certain levels, the frustration from not being able to beat a challenge, or the elation of finally overcoming a quest. All of these experiences add up to joyful memories even though you never beat the game. The same applies to your OP Heroes Journey. You may choose several Games that you may never beat, but that’s ok. I may never launch a product that hundreds of millions of people use (I truly hope that’s not the case), but in the end, I know that in my heart I will feel proud that I tried and grateful for the Allies I made, Skills I gained , and Quests I conquered along the way. This is the first post in a series that will dive deep into the 6-steps of the 10K HP strategy guide. We will publish a post once per week and will email our subscribers to notify them about the published post.